If you'd like to take part in a challenge event and raise money for Stonewall Cymru, we’re here to support you every step of the way! We can offer advice and guidance on your fundraising plans and supply fundraising materials such as posters, stickers and collection tins. 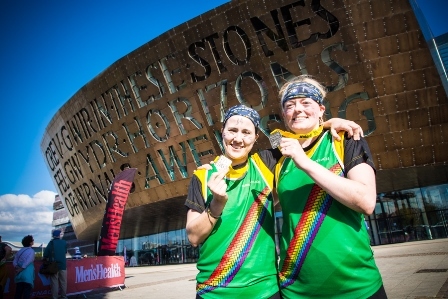 If you're taking part in a race or an obstacle course, we will send you a Stonewall Cymru running top, and a pair of rainbow laces, but most importantly of all, we’ll provide bags of enthusiasm and encouragement along the way! Join our Survival of the Fittest team! Join our Cardiff Half Marathon team! We're here to support you every step of the way! Get in touch by emailing Cymru@StonewallCymru.org.uk or call 08000 50 20 20.